Entering values with the keyboard is not the only way you can edit values in a table. In some cases, you might want to perform a mathematical calculation to set a field value for a single record or even all records. You can perform simple as well as advanced calculations on all or selected records. In addition, you can calculate area, length, perimeter, and other geometric properties on fields in attribute tables. The sections below include examples of using the field calculator. Calculations can be performed using either Python or VBScript. Python is the recommended scripting language for ArcGIS. Use Python if you want access to geoprocessing functionality, including feature geometry. The adoption of Python as the scripting language for ArcGIS provides many opportunities for performing calculations. Use VBScript if you have VBA or VBScript experience and are comfortable with the scripting syntax. Saved .cal files from previous versions of ArcGIS may work or require minimal modifications. If you have VBA code from past releases that use ArcObjects, you will need to modify your calculations. When naming variables, note that Python is case sensitive, so yield is not the same as Yield. VBScript does not allow you to explicitly declare any data types; all variables are implicitly Variant. Statements like Dim x as String should be removed or simplified to Dim x. After entering statements, you can click Save if you want to write them to a file. The Load button will prompt you to find and select an existing calculation file. Characters in a string field can be accessed by indexing and slicing in Python. Indexing fetches characters at an index position; slicing fetches a group of characters. The second to last character. Python also supports string formatting using the str.format() method. Combine FieldA and FieldB separated by a colon. Strings are supported by a series of VBScript string functions, including Left, InStr, and Chr. Below are some VBScript examples for commonly used string functions in the Field Calculator. Left function: Return a Variant (String) containing a specified number of characters from the left side of a string. Right function: Returns a Variant (String) containing a specified number of characters from the right side of a string. Mid function: Returns a Variant (String) containing a specified number of characters from a string. FirstWord = Mid(MyString, 1, 3) ' Returns "Mid"
LastWord = Mid(MyString, 14, 4) 'Returns "Demo"
MidWords = Mid(MyString, 5) 'Returns "Function Demo"
InStr function: Returns a Variant (Long) specifying the position of the first occurrence of one string within another. Chr function: Returns a String containing the character associated with the specified character code. & operator: Used to force string concatenation of two expressions. One of the numbers in the operation must be a decimal value: 3.0/2 = 1.5. How the code block is used is determined by the parser used. The Field Calculator supports Python and VB Script parsers. Calculations are performed using VBScript. 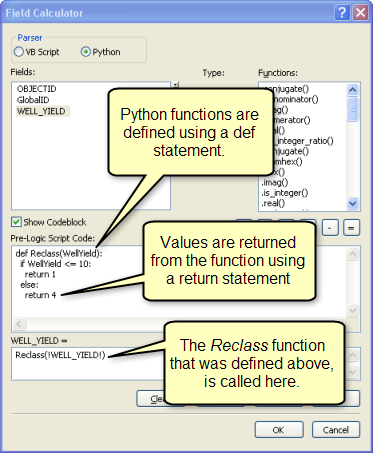 Python functions are defined using the def keyword followed by the name of the function and the function’s input arguments. A Python function can be written to accept any number of input arguments (including none at all). Values are returned from the function using a return statement. The function name is your choice (don't use spaces or leading numbers). Remember, Python enforces indentation as part of the syntax. Use two or four spaces to define each logical level. Align the beginning and end of statement blocks, and be consistent. For more on converting geometry units, see the section 'Geometry unit conversions' below. For a point feature class, shift the x coordinate of each point by 100. Calculate the date to be December 31st 2000. Calculate the day of the week (for example Sunday) for a date value in a field. Replace any cases of an uppercase "P" with a lowercase "p". Python's re module provides regular expression matching operations that can be used to perform complex pattern matching and replacement rules for strings. Replace 'St' or 'St.' starting new words at the end of the string with the word 'Street'. Using a Python expression, null values can be calculated using a Python None.